The CorPower C3 Wave Converter (WEC) being installed. 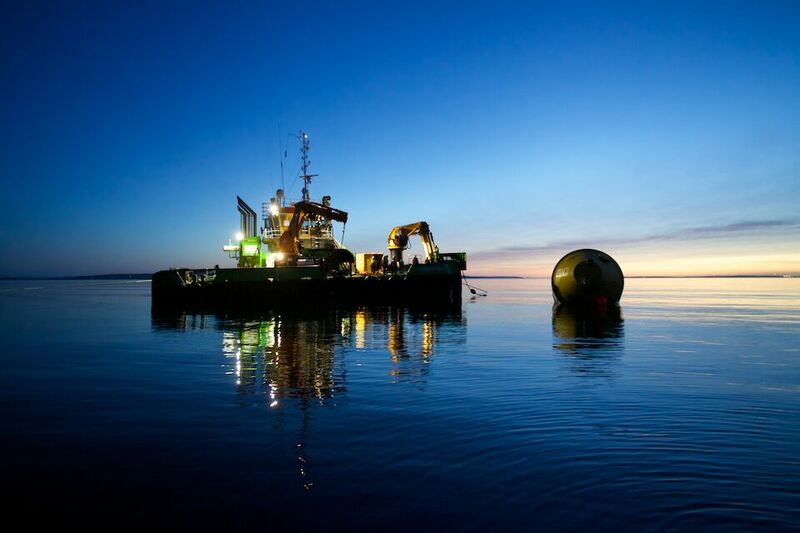 The C3 Wave Energy Converter (WEC) has been test installed by CorPower Ocean within the European Marine Energy Centre (EMEC) Scapa Flow site near Orkney, Scotland. In collaboration with local contractor Green Marine (UK) Ltd, CorPower towed the device to site and undertook the installation at EMEC’s scale test facility. The C3 WEC was then connected to a floating microgrid unit provided by EMEC. The microgrid allows the floating device to act as if it were connected to the National Grid, simulating grid connection and allowing it to absorb power and feed it out to auxiliary systems. Patrik Möller, CEO at CorPower Ocean, said:“We are very pleased to have the C3 WEC installed at EMEC, marking a major milestone in our effort of providing reliable and competitive electricity generation from ocean waves. This demonstration programme shows how our resonant WEC technology can significantly reduce both CAPEX and OPEX of wave energy. Having gone through its on-grid paces in Stockholm, this part of the testing sequence is designed to see how the C3 WEC works within the sea and the associated hazards. Neil Kermode, managing director at Green marine, added: “Installing technologies into the harsh marine environment is not easy, requiring a great deal of planning, ingenuity, and collaboration. But I know the learning that will come from operating the technology in the sea will be invaluable to CorPower.